Eco friendly mountain retreat with tree house accommodation in privately owned woodland location. 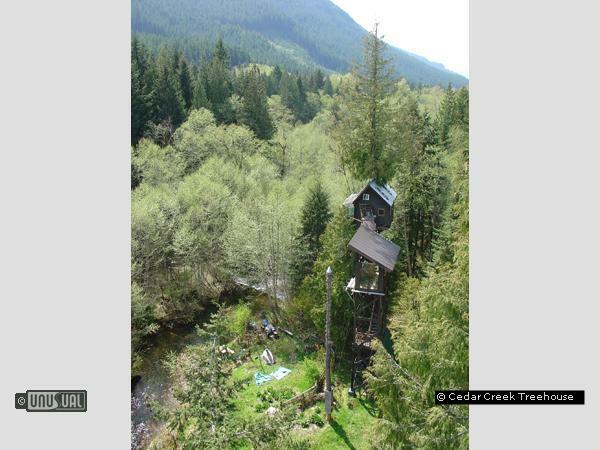 Cedar Creek Tree house is an Earth-friendly, privately owned and operated mountain retreat, located one mile as the crow flies, 10 miles by car, from the Nisqually River Entrance to Mount Rainier National Park, and bordering the Gifford Pinchot National Forest. They offer unique tree house vacation rental lodging with this "bed and breakfast" cottage 50 feet up in a 200-year old Western Red Cedar tree. Two night minimum - we no longer offer single nights. 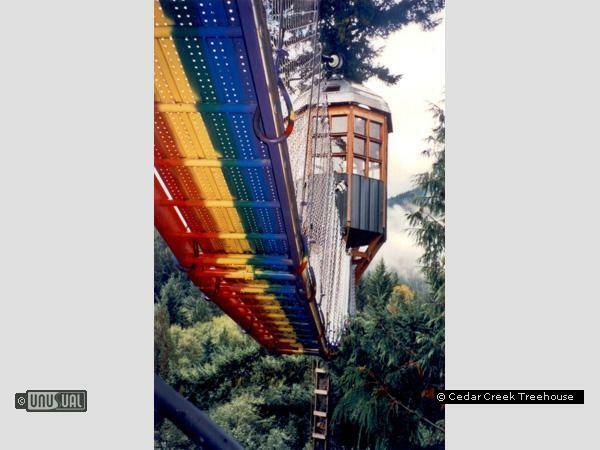 Tour includes The Stairway To Heaven Spiral Staircase, Rainbow Bridge, Treehouse Observatory, Sunbridge and Floating Treehouse; where guests are free to video, photograph, use the binoculars, and enjoy incredible views of Mt. Rainier and the Nisqually Valley ... 100 feet in the sky! See the new 165 foot slide, our latest creation! 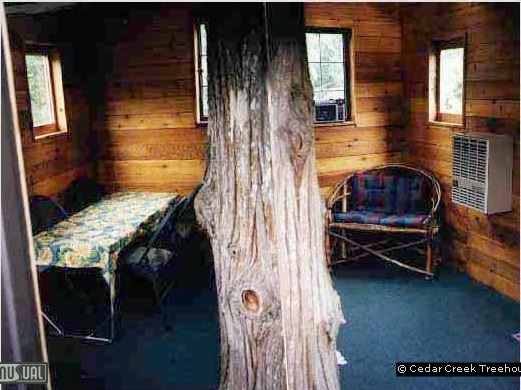 We only offer lodging in the Cedar Creek Treehouse, thus assuring your privacy. There are no other guests. To Make Reservations call 360.789.6773 . We do not use email! That's right folks. You will need to call us by phone to book or if you have questions. -- Please call us after March 1, 2015, to make your reservation. We WILL be taking special winter-spring bookings on a "weather-permitting", spontaneous basis this season. For example, if the forecast looks good, and snow is not a threat, then call us a few days before you want to stay. This will only work for people living within a few hours drive from us (i.e. -- Western Washington and Oregon). 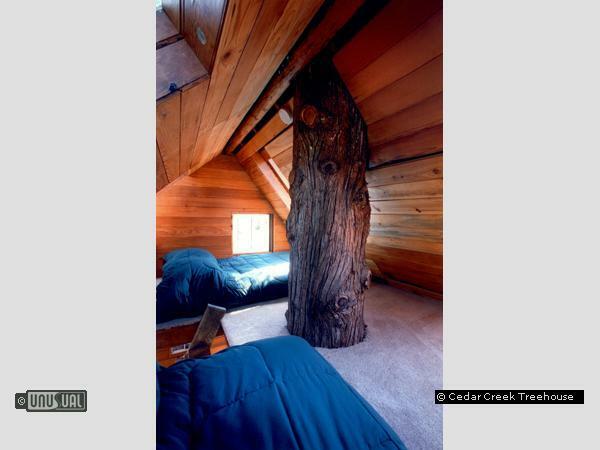 -- Cedar Creek Treehouse has a strict NO SMOKING policy. For reasons of fire safety, health, odor, enviromental concerns, and respect to the 99% of our guests who don't smoke, PLEASE BE ADVISED : If not smoking on the premises poses a problem for you, then this isn't the place for you ! -- We love animals, but they don't work out here. Please, leave your pets at home! Thanks. -- Cash, check or money order. Full advanced payment is required to hold reservations. A ten-week notice is required for a complete refund.